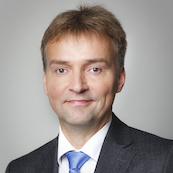 Since 2015, Mr. Martin Schleef is Head of the Business Unit Machinery and Equipment Industry at Fraunhofer Institute for Manufacturing Engineering and Automation (IPA). In this position he is initiating research projects, and he is coordinating the projects with the 15 departments at Fraunhofer IPA. He studied chemical- and process engineering at the Technical University of Hamburg-Harburg. Following his studies, Mr. Schleef worked for 18 years in factory planning, factory- and plant engineering for Semiconductor-, Flant Panel- and Photovoltaics industry in Germany, several countries in Europe and in Taiwan. He worked at M+W Group for 15 years, were he took positions in engineering, project management and department management.